Dean Creative partnered with an Alexandria, VA design firm to re-brand “YourDocs.com”, a service that provides consumers with medical advice and electronic medical record storage. This project entailed healthcare web copy and SEO along with a range of other marketing projects to build and shape a dynamic new brand. Originally, the name “YourDocs” was widely perceived by physicians to be unprofessional, flippant, and misleading. So, it was essential that new name and tagline be credible, professional, and memorable. Peggy and Brian Dean were hired to create a variety of names that would satisfy many constituents: the owner, investors, the board, staff as well as participating doctors, pharmacists, and nurses. Fortunately Brian and Peggy are prolific writers and have much experience generating a wide variety of names that approach problems from different angles. Plus we have vast experience working for many organizations developing healthcare web copy and SEO. All told, we created more than 55 names and three dozen taglines over the course of four rounds of intensive scrutiny. Ultimately, Brian’s recommendation was: MedVisors. For Greater Net Health. This line played off what most people tend to focus on: building greater net wealth. Plus, the word “Net” reinforced that MedVisors is an internet-based health service. OBJECTIVES: Develop a new website with effective healthcare web copy and SEO; explain this new service and motivate people to enroll; leverage our new brand identity and voice; write copy in a warm, helpful tone; streamline information in a confusing, chaotic industry. SOLUTION: We wrote healthcare web copy primarily for aging consumers and their adult children. We also wrote various pages just for doctors and healthcare professionals. We explained succinctly how this great service benefits people and how it can ensure accuracy and quality healthcare. 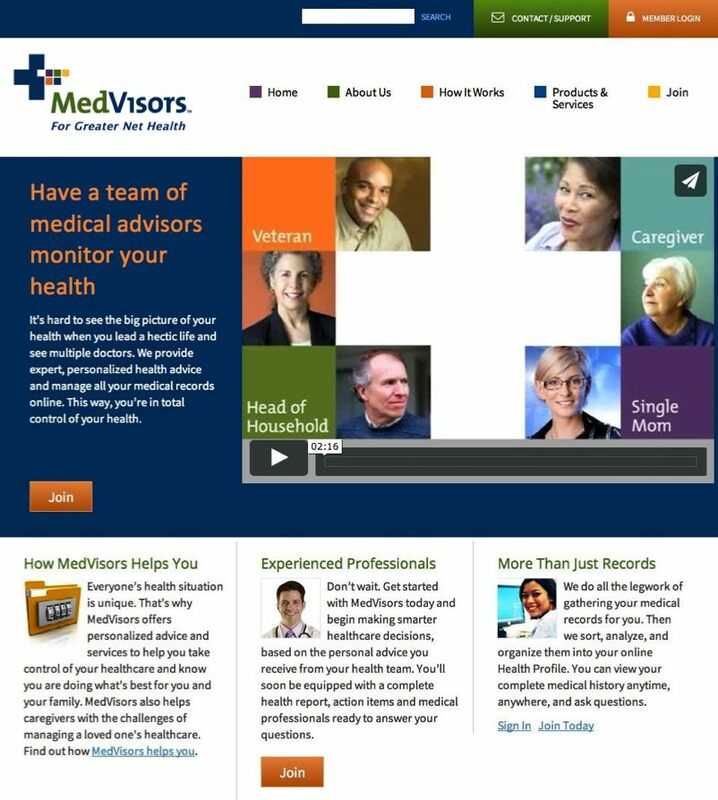 EXECUTION: MedVisors.net is clean, concise, and creative. The home page features an original video with animated lifestyle imagery, music, and a voiceover that explains the entire service in a friendly, reassuring manner. The site includes applications, a Q&A, and more. RESULTS: The company was launched successfully and has seen a positive, steady increase in membership enrollment. This is an achievement today given the escalating costs of healthcare, the confusing nature of finding a new plan, and the cumbersome application process.